PlanoTXNotary.com is committed to protecting your privacy. This Privacy Statement sets forth our current privacy practices with regard to the information we collect when you or your computer interact with our website. By accessing PlanoTXNotary.com website/blog, you acknowledge and fully understand PlanoTXNotary.com’s Privacy Statement and freely consent to the information collection and use practices described in this Website Privacy Statement. Related services and offerings with links from this website, including vendor sites, have their own privacy statements that can be viewed by clicking on the corresponding links within each respective website. Online merchants and others who participate in PlanoTXNotary.com services are encouraged to participate in industry privacy initiatives and to take a responsible attitude towards consumer privacy. However, since we do not have direct control over the policies or practices of participating merchants and other third parties, we are not responsible for the privacy practices or contents of those sites. We recommend and encourage that you always review the privacy policies of merchants and other third parties before you provide any personal information or complete any transaction with such parties. PlanoTXNotary.com collects certain information from and about its users three ways: directly from our Web Server logs, the user, and with Cookies. PlanoTXNotary.com reserves the right to share aggregated site statistics with partner companies, but does not allow other companies to place cookies on our website unless there is a temporary, overriding customer value (such as merging into PlanoTXNotary.com.com a site that relies on third-party cookies). This web site uses a third party service to manage administrative tasks. If you leave a comment, submit personal information via a contact form, or otherwise exchange personal details with us, it is possible that we may use this service to manage that data. PlanoTXNotary.com Website/blog Web pages may contain electronic images known as Web beacons – sometimes also called single-pixel gifs – that allow PlanoTXNotary.com to count users who have visited those pages and to deliver co-branded services. PlanoTXNotary.com may include Web beacons in promotional e-mail messages or newsletters in order to determine whether messages have been opened and acted upon. Some of these Web beacons may be placed by third party service providers to help determine the effectiveness of our advertising campaigns or email communications. These Web beacons may be used by these service providers to place a persistent cookie on your computer. This allows the service provider to recognize your computer each time you visit certain pages or emails and compile anonymous information in relation to those page views, which in turn enables us and our service providers to learn which advertisements and emails bring you to our website and how you use the site. PlanoTXNotary.com prohibits Web beacons from being used to collect or access your personal information. We will provide you with the means to ensure that personally identifiable information in your web account file is correct and current. You may review this information by contacting us by sending an email to our support attendant – roberta@planotxnotary.com. PlanoTXNotary.com has the discretion to occasionally update this privacy statement. When we do, we will also revise the “updated” date at the top of this Privacy page. We encourage you to periodically review this privacy statement to stay informed about how we are helping to protect the personal information we collect. Your continued use of the service constitutes your agreement to this privacy statement and any updates. 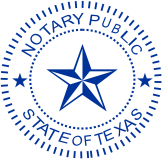 PlanoTXNotary.com will use commercially reasonable efforts to promptly respond and resolve any problem or question. – the person requiring notarization does not have proper and valid (unexpired) ID. – the person is not mentally competent to sign. – the signer does not speak and understand English. – you have a large and/or aggressive animal which can’t be removed or contained. A Texas Notary Public who is not an attorney is not licensed to practice law in Texas and may not give legal advice or accept fees for legal advice. Under the Texas Admin. Code 87.43, a Notary Public is prohibited by law to act in the capacity of an attorney, give advice in preparing legal documents, issue identification cards, distribute confidential information. A Texas notary may not perform any notarial act unless the signer is present. Our notaries are not attorneys. We do not guarantee the truth or accuracy of the document. We have no obligation to verify the document’s content. We do not legalize or validate a document. We have a large minimum travel area and we apply our minimum fee to this area. Google and other online tools may indicate that we are very close to you based on an address but that doesn’t mean the notary is actually close at a given time. As a general rule, we do not charge an additional fee for after hours, less than 24 hour notice, holidays, etc. but it is possible to incur such fees based on current schedules. We will discuss this additional fee if it applies.